For Treasured, photographer Melanie Dunea of My Last Supper takes a peek into the minds of working chefs and gets them to reveal their most prized possessions. Chef Andrew Carmellini, of New York’s Locanda Verde, The Dutch and Lafayette, treasures the handmade pasta tools he purchased while living in Italy. 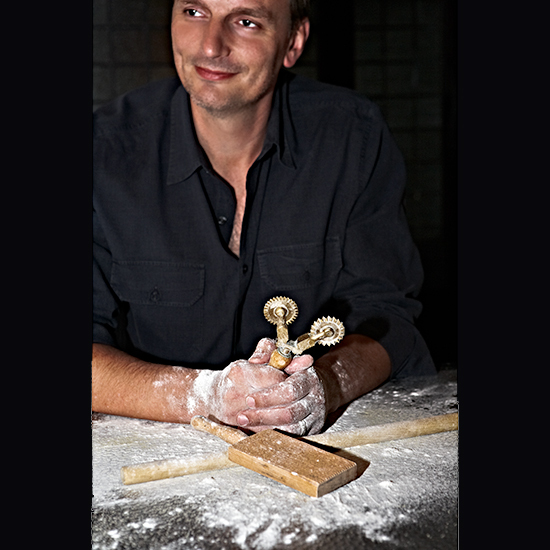 To see them, click through the slideshow, Treasured: Andrew Carmellini's Pasta Tools. Carmellini uses them sparingly, but it wouldn’t be the end of the world if they broke. “I don’t even want to know if you can buy these online because I want to have an excuse to go back to Parma, check out some cute girls on bikes, buy some pasta tools and then come back.” Here, his top three tips for making fresh pasta, no precious tools needed. 1. Forget about tricks and just have fun. Try not to take it too seriously; it should be a fun experience, not a stressful one. 2. Use your hands, flour is going to go everywhere. If you follow the recipe and have a good dough recipe, it won’t fail. 3. Let it rest overnight, there is a little bit of science to that. We do that at Locanda Verde but you could probably let it sit out for an hour and you’d be OK. Room temperature is best because then you don’t have to deal with a big cold lump. In Italy, they just let it sit out with a towel over it.